Yeah, yesterday's column? Um ... no. 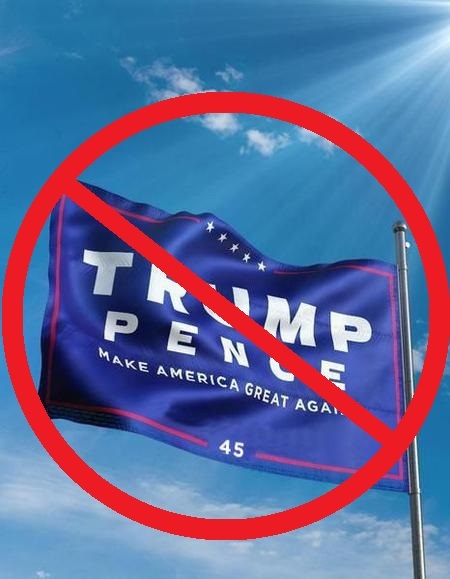 Yesterday I posted that I had undergone a change of heart, a radical shift in my political leanings, and that I was supporting trump in the 2020 election. This was partly an April Fool's gag, but also an experiment to see a) who believed it, and 2) what the subsequent reaction was. And the results are in: very few people bought it. This was kinda what I expected. It turns out this probably would have worked a lot better if I had spent a couple of months building up to it ... but then it would have been a whole thing, and I would have had to get the cooperation of the mainstream media (who, as you well know, follow every word of this blog slavishly) it just ain't worth the trouble. So, as far as the "let's see if they believe this" thing, well ... they didn't. And as far as April Fool's pranks go, it kinda fizzled and fell flat. I gotta lie down. Please like and share this post from my Facebook page at www.facebook.com/blowhardpundit, and please consider making a donation to my advertising fund at www.gofundme.com/blowhardpundit. Let me start by saying, despite it being April 1, this is not an April Fool's gag. There may be one or two of you out there who have been wondering where I've been and why my usual firebrand style of liberal rhetoric has been quite blatantly missing from my posts. The reason for this? I have been having doubts. This has been fueled in large part by the Democratic Party's unwillingness to be straight with me. They have been so caught up in anti-Trump propaganda that they have lost sight of their mission to govern effectively, and have actually worked against the best interest of the country simply to spite the president. Don't get me wrong. The Republicans have been just as bad in many ways (especially Mitch McConnell, a lying, propagandizing hack of such monumental proportions that he makes Joseph Goebbels look like a failed use car salesman). However, at least they have remained true to their core principles, whereas the Democrats have pretty much been about nothing else than being against President Trump. Don't get me wrong. There is still a lot about our president of which I disapprove -- the constant lying, the petty bickering, and so on. But I dare you to point to a politician who doesn't lie ... it can't be done. It's almost a job requirement. And after seeing the hysterics and mental gymnastics performed by those on the left who refuse to give the president any credit for anything, combined with recent polling data, and culminating in the release of the Mueller report and the subsequent revelation that there was no evidence of collusion, I have been forced to re-evaluate my position. it wasn't easy, let me tell you. One of the most difficult things any person -- right, left, male, female, black, white -- can do is to utter the words "I was wrong." History is replete with examples of people who were willing to accept extreme punishment and abuse -- sometimes even death -- in favor of saying those three words. 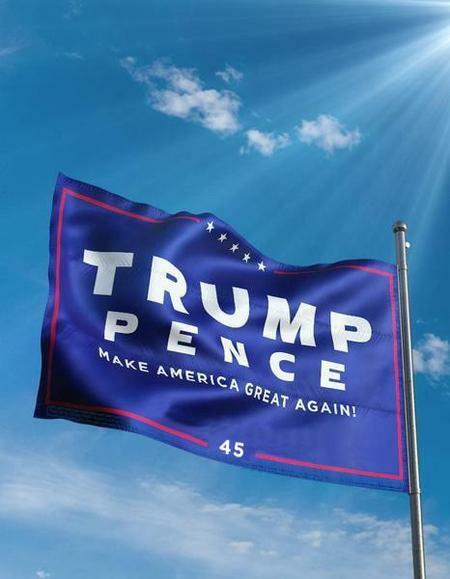 Therefore, I will be supporting the re-election of Donald Trump in 2020. There's simply too much at stake, economically speaking, to do otherwise. Since he has taken office, we have seen the Dow soar to unprecedented heights, falling unemployment, and increases in take-home pay for average Americans. These are all salutary effects. We have also seen foreign policy positions that are unprecedented (or "unpresidented," since people like to make as much hay out of slips of the tongue as possible) in American history. From negotiations with North Korea to shutting down Iran's nuclear program, President Trump has staked out positions that are bold, fearless, and with a tenacity and fierceness never before seen in our history. Look, the guy's not perfect. I get that. He's coarse. He plays fast and loose with the truth. He doesn't seem like a very happy person. But he is very clear on where his interests lie and what his goals are, and that lack of ambiguity is refreshing. Now, I know this will engender screaming vitriol from my friends on the left. It's unfortunate, but it is what it is. Sadly, there is no litmus test, no magic bullet to which I can point that will help them understand that this was not something I undertook lightly. Also sadly, this will likely spell the end of some friendships, given the highly polarized state in which we are currently embroiled. I wish it wasn't so, but such is the nature of America in 2019, I guess. Please like and share this post from my Facebook page at www.facebook.com/blowhardpundit, and please consider making a donation to my advertising fund at www.gofundme.com/blowhardpundit. On Thursday, March 21, I was performing as Verges in the Steel River Playhouse production of William Shakespeare's "Much Ado About Nothing." Verges is a tiny role, so I only have four scenes in total: two in act I and two in Act II (I'm talking about the acts as set up by the director, not by Billy Shakes ... he had six acts in this play). About halfway through my first scene, my right foot abruptly went completely numb. At the time I wasn't too concerned; this had happened before as a result of the costume not being a perfect fit (hey, it's a volunteer gig, so it's not like there's a professional seamstress on staff to attend to the costume alteration requests of seventeen people). However, when I came off stage and sat down, it didn't go away. I figured that the first scene was my biggest one, I only had one more to go before intermission, and the final two scenes basically involved me standing there and reacting to Dogberry, so I could just power through and get a good night's sleep and everything wold sort itself out. During intermission, in the green room, I was leaning up against a counter. My arms started shaking, then my right leg announced that it was no longer happy with its working conditions and therefore was going on strike. I collapsed. 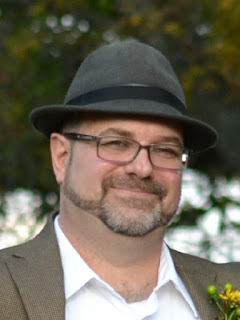 I was still somewhat lucid, but my entire right side had become pretty much useless, there was significant facial drooping -- all the classic signs of a stroke. I had suffered two strokes pervious to this: one on February of 2017 that was centered in the pons (a region of the cerebellum that, my neurologist informed me, was arguably one of the best places to have a stroke). The second was in June of 2017 and was rather inconclusive ... the neurologist at the hospital described the MRI as "fuzzy" and that as best as she could figure out it was something that happened in the white matter in the brain. And here's where it gets interesting. But first, a little anatomy lesson. In the diagram above, you can see the aortic arch. The aorta, as you are undoubtedly aware, is the main artery coming from the heart. It loops up by the collarbone (from whence the carotid artery splits off) to supply blood to the arteries of the head, face, and neck, before descending into the lower part of the body. 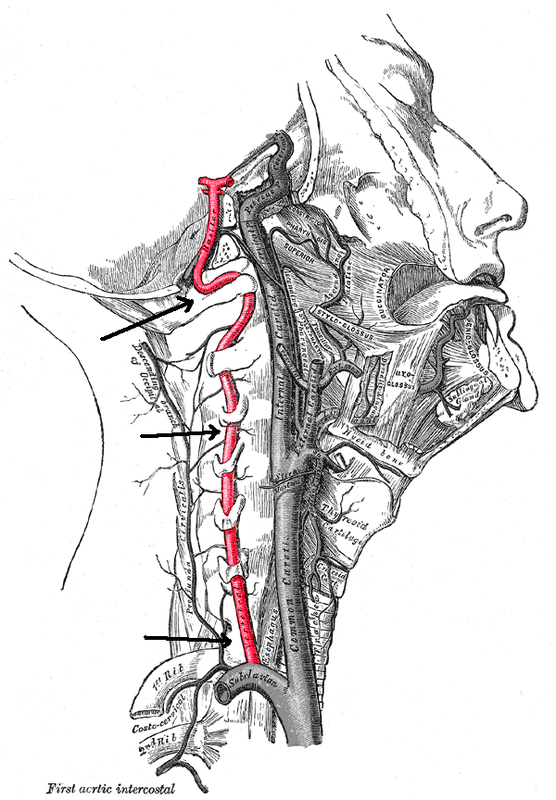 In the diagram above, you can see the vertebral artery (in red) emerging from the aortic arch and ascending along the spine -- not inside the spinal column itself, but tucked into the spinal processes. There are actually two vertebral arteries, one on each side. Above is a sort of schematic of the vertebral artery system. 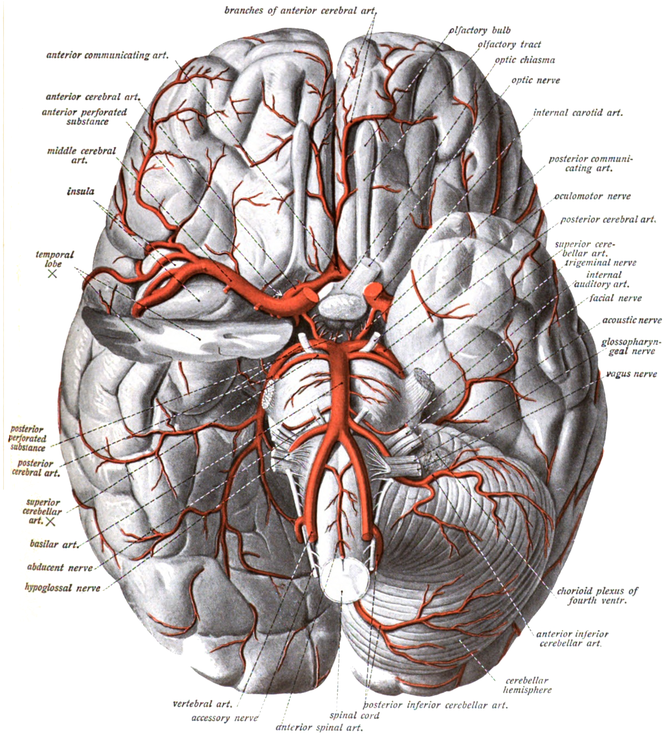 These arteries are located at the base of the brain, as shown below. 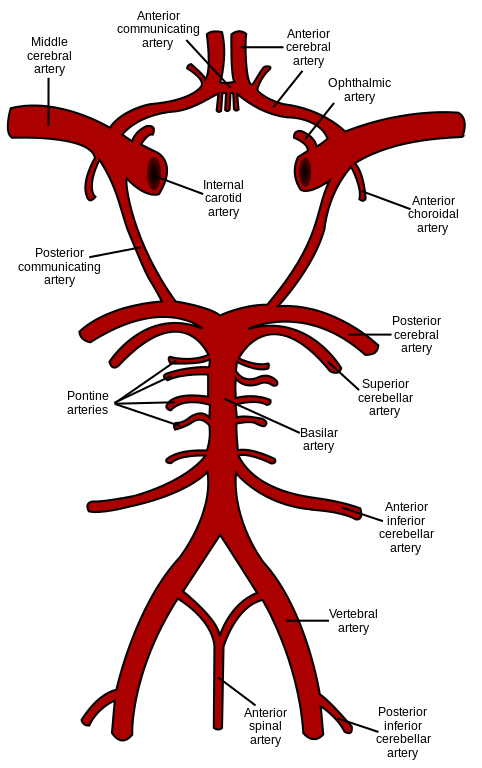 The vertebral arteries in relation to the brain. As you can see, these things are tucked right up against the underside of the brain in an area that is virtually impossible to get to surgically (this will become relevant later). Given my symptoms both in June of 2017 and this past Thursday, it looked for all the world like I was having a stroke or, at least a TIA (transient ischemic event). The difference between the two? A stroke leaves permanent footprints on the brain, whereas a TIA is just what it sounds like: a temporary blockage of an otherwise healthy blood vessel that leaves no residuals. My stroke in February of 2017 left me with a 5-10% strength deficit on my right side. Most of the time it's not at all apparent, but when I get tired (say, if we've spent the day at Longwood Gardens walking a lot) I will develop a limp and my right eyelid will droop. Other than that I was extremely lucky in that there were no other permanent effects. For the these last two events, though, they didn't quite fit either classification. They couldn't be considered actual strokes in that there were no marks left in the brain, but they couldn't necessarily be thought of as TIAs either due to the severity and the fact that TPA (Alteplase IV r-tPA, a clot buster drug) reversed symptoms (as far as I know, tPA has no effect in a TIA situation). On Saturday I met with the neurologist on staff. I was curious as to why it took two days to see the guy, but this became clear when he presented his hypothesis. The hypothesized arrangement of the arteries in my brain. According to the doc, what has been happening is that this artery, being undersized and with narrower walls, really isn't sturdy enough to hold itself open; it relies on my blood pressure to do that. However, after the first stroke, I was prescribed medication to reduce my blood pressure -- which, let's face it, wasn't really that bad off to begin with, but it is accepted practice to prescribe blood thinners to stroke patients. What this did was to reduce the blood pressure enough so that it was right on the cusp of being insufficient to support this artery. The doctor's hypothesis is that, both in June 2017 and on Thursday, my blood pressure dropped enough to pass that threshold. As a result, blood flow to that portion of the brain was cut off, and stroke symptoms emerged. However, with the administration of tPA, my blood became thin enough that it could squeeze through this artery and force it back open, restoring blood flow. In retrospect, this makes a whole lot of sense. Several times over the past coupe of years -- too many to count, to be honest -- I have noticed that my right side weakness would become a little more severe, or I would notice facial drooping in the mirror, etc. In all of these situations my reaction was "Oh, crap. Not again" and I would started getting a little torqued up ... which would (presumably) elevate my blood pressure, open the artery back up, and the symptoms would subside. At this time my only course of treatment is to stop taking the blood pressure meds. 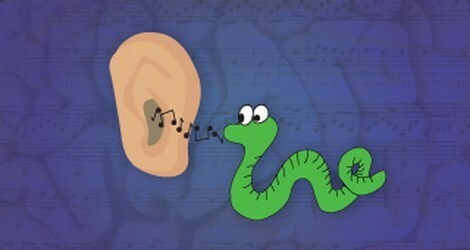 I will be consulting with my neurologist, at which point there may be other options. Based on everything I have been told, though, it doesn't look like a surgery to go directly at it and expand the artery is possible based on its location. It may be possible to have a stent put in via catheterization, but then again I'm not a doctor and really have no idea what the hell I'm talking about. So this was my weekend. How was yours? I gotta lie down. Literally. So for the past several weeks I have been posting semi-regular updates about the music that has appeared unbidden in my noggin, often with absolutely zero relevance to what has been going on in my life at the time. A couple of been monumentally annoying, others have been sublime, and most of them have been simply enjoyable. What has been surprising to me is the relative under-representation of the music of the 60s and 70s in this list. While there are some notable entries, (Frank Zappa, CSNY, Bowie, George Harrison from the 70s, the Beatles and Marvin Gaye from the 60s) the majority seems to be coming from the New Wave movement in the 80s. Regardless, one of these days I am going to take all of these and compile them into a killer, somewhat odd and disturbing, playlist. For now, y'all can pick and choose as you see fit.